Monsanto, the world's largest producer of genetically engineered products, claims their patented GM seeds and bovine growth hormone (BGH) will increase worldwide production of agricultural, dairy, meat, and Bt cotton and can eradicate world hunger and poverty. 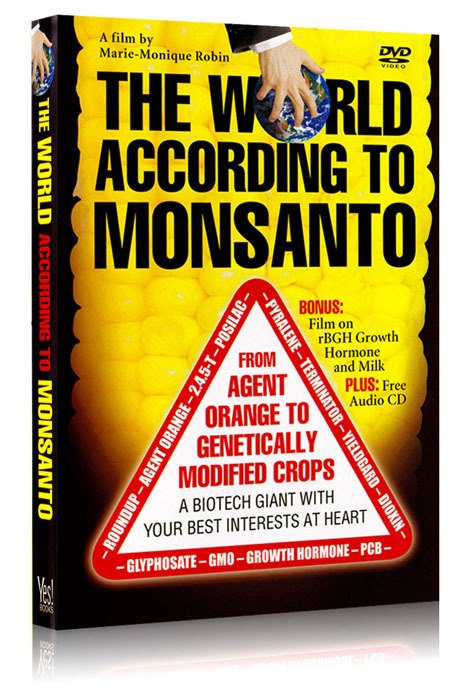 However, Monsanto (maker of Agent Orange) is frequently described as the Gestapo and mafia by farmers who use their products due to their use of pressure tactics, attempts at corruption, misleading reports and collusion with the American government. The World According to Monsanto pieces together the true, unsettling story of how the clean, green image conveyed by the company's advertising serves as a smoke screen for Monsanto's quest for market supremacy — to the detriment of global food security, public health and environmental stability. "A film that should be seen as widely as possible ... scrupulous, thorough and damning."